I am using a cute branch of flowers from Beccy's Place. The card base is SU natural cs. I find it goes very well with the watercolor paper. The bashful blue is also SU cs. The image was printed onto artist loft 90 lb paper. The trim on the top and bottom of the card I used the MS trellis punch. The stamp is from SU well scripted set. 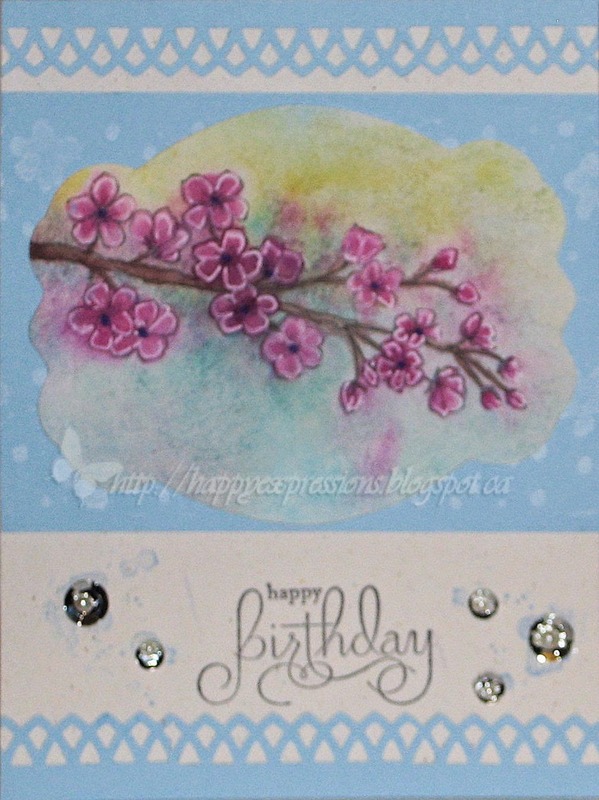 I used a spellbinders die to cut the image after it was watercolored. I then used the gorgeous grunge on each side of the sentiment but then I wish I hadn't. So I decided to cover some of it up by putting in some silver sequins and then added some pearls on the top of them. I then decided it looked finished. I will enter this card into this challenge. Thank you for stopping by, happy creating and have a great day! Your card is beautiful Carol, the colours are gorgeous and soft. I love the way you've done the flowers they are very artistic. The punched border looks wonderful too!